Lager month is in full affect here at Tapped! This week we are celebrating a local beer that is a damn good lager AND pays homage to our military. 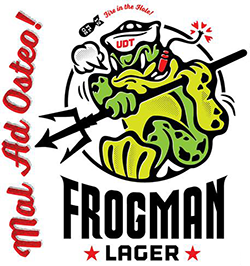 The Bold Mariner Brewing Company Frogman Lager is our lager of the week! Frogman Lager is a Vienna styled lager sitting at a comfortable 5.3% with a nice combination bread- malt flavors, a little caramel, and a nice crisp finish (with a little hop). Yes, a Vienna Lager is a style of beer, not the name for one (for our beer nerds). Vienna Lager is a style of beer that originated in the second half of the nineteenth century in Austria and was a unique take on the popular lager craze throughout Europe. Two renowned brewers of that century, Anton Dreher (Austria) and Gabriel Sedlmayr (Germany), sought out to enhance the popular Munich dunkel (the godfather of German beers). A simple switching of malts, going with a pale malt bill, the Vienna Lager was born. This is a brief history of the origins of the Vienna Lager but hopefully enough to embody that the Devil didn’t come up nor perfect this style! The Bold Mariner Brewing Company is out of Norfolk, Virginia and is a solid addition to the Norfolk beer community. Owner, Michael Stacks’ has ties within the Navy community (having served himself) and a history of brewing beer, so opening a brewery in Norfolk was a no-brainer. Stack’s use of military inspired beer names like Frogman, Night Hawk, and Liberty Risk, has brought the best of both of his worlds to an area that shares the same fondness. Bold Mariner is making a good name for themselves in Hampton Roads, and having a staple beer in Frogman surely helps. It’s even on tap at the governor’s mansion! Frogman Lager is a solid beer, but the military background and theme of the brewery makes it an added bonus for us at Tapped. We are a constant supporter of our active duty and retired service men and women. For 5 years we have and still continue to provide a 50% discount on all food items every Monday at both of our locations (Gastropub and Crafthouse). It’s our way to give back to those who serve us, by serving them. Come on by either one of our Tapped locations this week and grab a pint of the Frogman Lager. Previous Post: Who doesn’t love the Weekend!